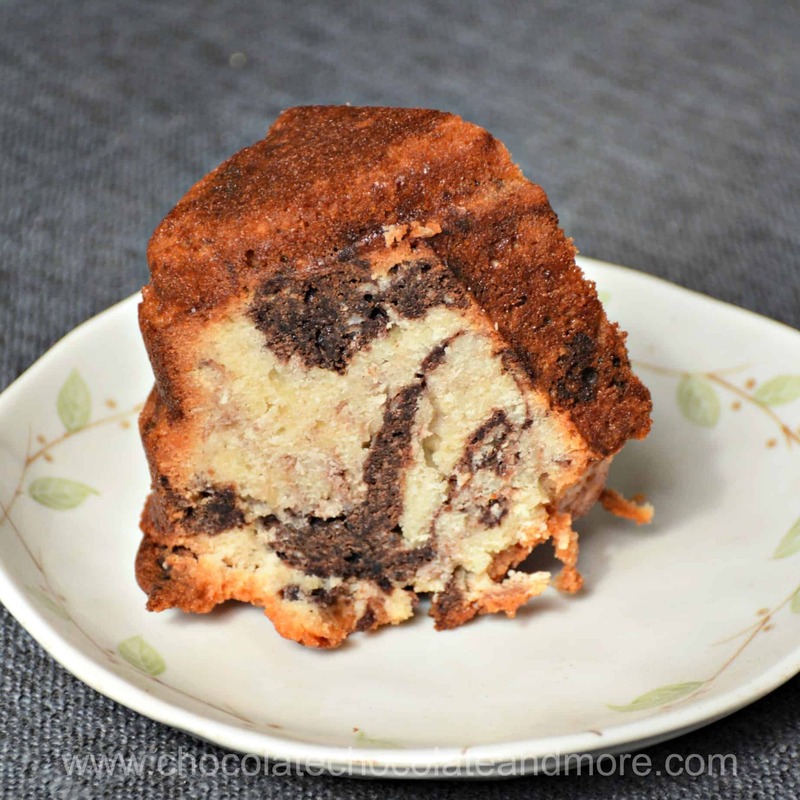 Coconut Marble Bundt Cake - Chocolate Chocolate and More! 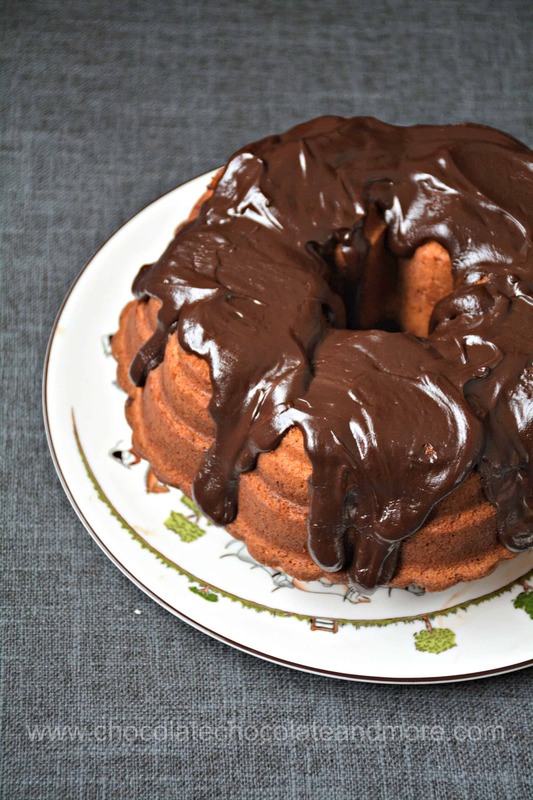 Take moist coconut cake and swirl in some chocolate and you’ve got Coconut Marble Bundt Cake. 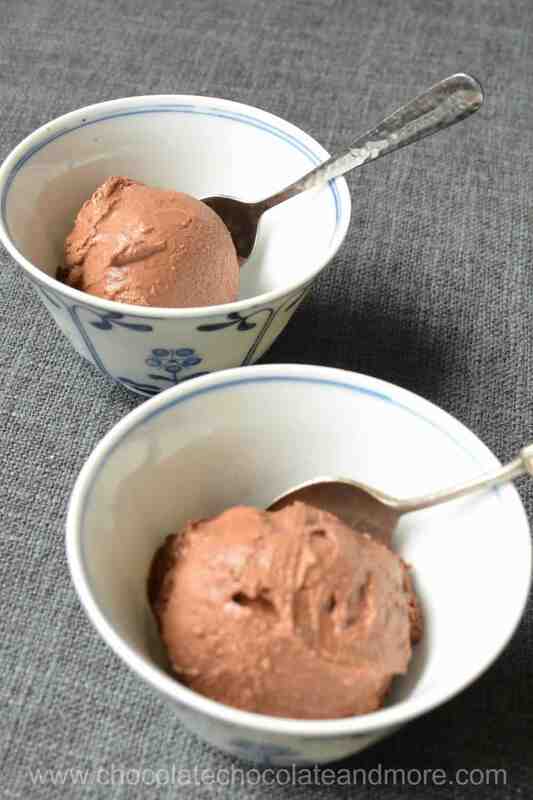 Dress it up with some chocolate ganache for dessert or have it plain with coffee. Some friends of mine invited me to their wedding anniversary and they asked me to bring a cake. They’re Pakistani refugees and their story is enough to bring tears to your eyes. The parents have been married for about 30 years so this is indeed a special anniversary! I have a sweet little Wilton heart bundt pan (affiliate link) so thought it would be fun to make them a cake in that. I’ve also been wanting to make another chocolate and coconut cake for a while. Last time I made a chocolate cake with coconut filling so I thought I’d invert it this time. On the first attempt I made separate batters, put the chocolate on top and swirled with a knife. But when I inverted the cake, all the chocolate stayed in a lump on the bottom. It was good but not exactly a coconut marble bundt cake. The other issue for me was that the chocolate ganache was so thick it covered up the hears. Not that anyone really minded. My second swirling method was actually a mistake. I pulled out a cup of the coconut batter to add the chocolate to and then got distracted. In my distraction, I dumped the cocoa powder in the wrong bowl. Have you ever done that? It’s the story of my life so I’ve learned lots of ways to fix things. I had a choice. Mix it in or scoop as much out as possible. I opted for the latter. I got most of it out (with a little batter to boot but there was already chocolate in my coconut. So I thought why not just swirl the chocolate batter in before putting it in the pan. The result was a much more marbled cake – exactly what I wanted. I kept the second cake plain and took it to morning tea with my friends. Coconut mostly adds texture to this cake. I used coconut milk in the batter and the ganache to up the coconut flavor but it’s still mild. If you want more coconut, add some coconut flavor or coconut rum. You can always substitute whole milk or (better) cream for the coconut milk for a more vanilla flavored cake. Butter the inside of a 10 cup bundt pan well. Remove 1/2 cup of the batter and place in a small bowl. Add cocoa powder, espresso powder and baking powder. Mix well. Spoon chocolate mixture into coconut batter. Mix lightly to start the swirls. Pour into the pan evenly. Bake at 350°F for 45 minutes or until a cake tester comes out clean. Cool in pan until lukewarm. Remove and cool completely. Heat coconut milk until steamy (do not boil). Add chocolate chips and let sit for 5 minutes. Stir to combine. If needed set the bowl in a bowl of hot water to continue melting the chocolate. Drizzle over the cake. Hi Gail! With chocolate and coconut you just can’t go wrong. It’s a happy mistake! It makes me wonder if your sister Joan, up in heaven helped alittle bit. She loved her chocolate…just by looking at her blog name. Your doing a great job with her blog! Thanks J. I definitely feel Joan’s presence often – particularly when the recipes involve Kahlua. This recipe sounds delicious, but I noticed baking powder was listed twice, once 1 tsp and once 1/2 tsp. Could you clarify for me? Yes, the second 1/2 teaspoon of baking powder is added to the chocolate batter. The chocolate batter is more dense than the coconut batter so the extra baking powder helps lighten it up a bit so the texture of the cake is consistent. I hopt that clarifies things for you. I made this beast yesterday…wow! Yum!!! My marbling did not turn out nearly as beautiful as yours..I think the chocolate batter was too thick. I will add more coconut milk next time…yes, there will definitely be a next time!!!! 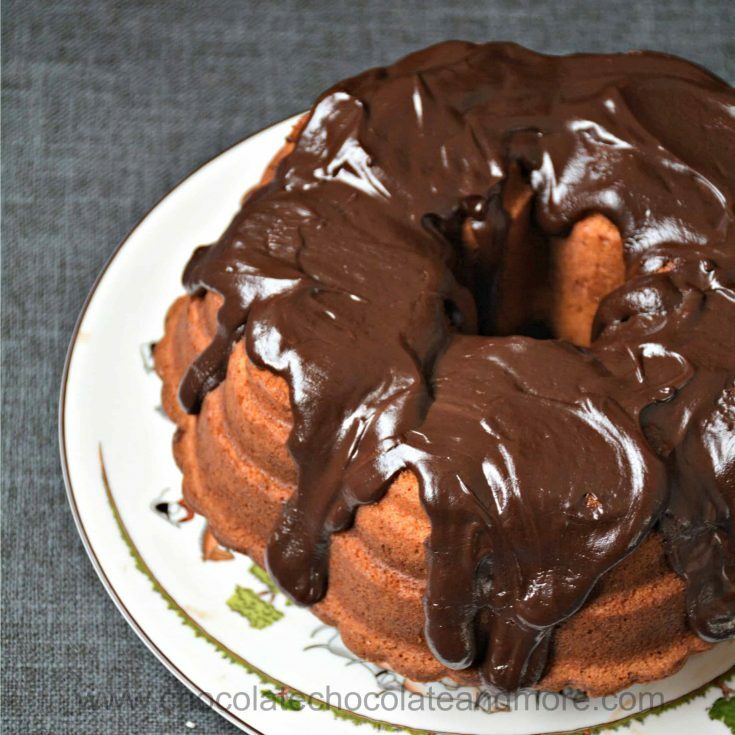 I combined the chocolate and coconut milk in a glass measuring cup, microwaved for 30 seconds, stirred and had the perfect consistency ganache topping…which helped hide the repairs from the cake sticking to the bundt pan. Brought back memories of why I avoid bundt pans…do you ever have issues with sticking? Thank you for a fantastic recipe. Hi Jyll. I’m glad you liked this cake. Yes, I sometimes have trouble with cakes sticking in the pan. I get the best results when I butter the heck out of the pan (I Use my fingers to make sure it gets in all the little places). Then I let the cake cool until it’s just warm before removing. Sometimes it still sticks but that worked with this cake.